Laparoscopic cholecystectomy ( LC ) has clearly become the procedure of choice for routine gallbladder removal. The advantages of this approach include decreased scarring, decreased incisional pain, shorter hospitalization and faster functional recovery. The recent years, many investigators have attempted to further improve on the established technique of LC. Generally, the goal has been to minimize the invasiveness of this procedure by reducing the port number and size. Two and Three-incision LC has been reported to be safe and feasible in various clinical trials that compare with standard Four-port LC. But no study compare between each groups. This study reports a prospective study that compart the clinical outcomes of the simple new technique Two -incision versus Three-incision LC. 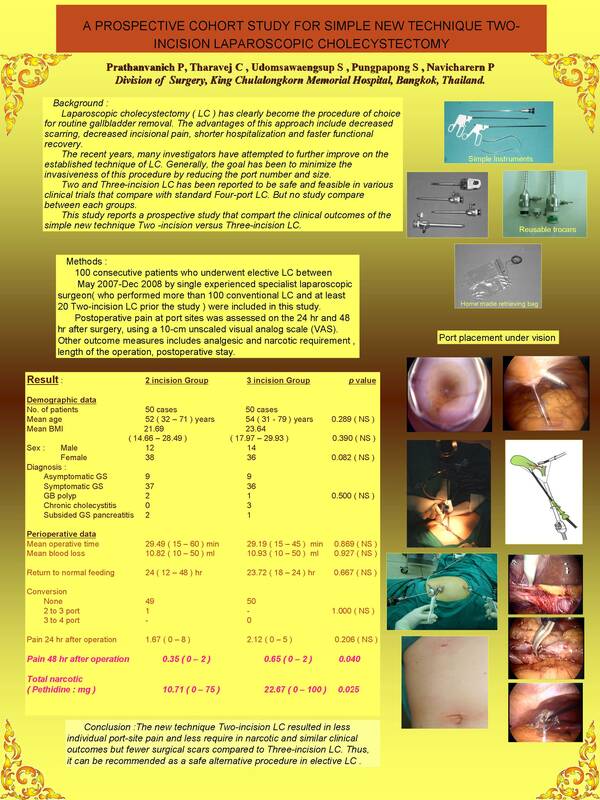 100 consecutive patients who underwent elective LC between May 2007-Dec 2008 by single experienced specialist laparoscopic surgeon( who performed more than 100 conventional LC and at least 20 Two-incision LC prior the study ) were included in this study. Postoperative pain at port sites was assessed on the 24 hr and 48 hr after surgery, using a 10-cm unscaled visual analog scale (VAS). Other outcome measures includes analgesic and narcotic requirement , length of the operation, postoperative stay. Of 100 LCs performed at participating unit during the study period and were separated to each of the procedures equally. The groups were well matched for demographic data. Patients in the Two-incision group had less pain at postoperative 48 hr significantly ( 0.34 vs 0.72 , p = 0.009 ) but not significantly at 24 hr ( 1.7 vs 2.2 , p = 0.130 ) , and less required narcotic requirement ( 11.00 vs 29.20 mg, p = 0.005 ) especially in men ( 10.42 vs 42.86 mg , p = 0.031 ) for first 24hr but not significantly in women ( 11.18vs 22.92 , p = 0.053 ). Operative time, postoperative stay, time to return to normal activity were similar between th two groups. The new technique Two-incision LC resulted in less individual port-site pain and less require in narcotic and similar clinical outcomes but fewer surgical scars compared to Three-incision LC. Thus, it can be recommended as a safe alternative procedure in elective LC .